The K9K is a family of straight-4 turbocharged diesel engines co-developed by Nissan and Renault. They have been in production and widely used since 2001. The turbocharger is provided by Borg-Warner. It has a displacement of 1461 cc and is called 1.5 dCi (diesel Common-rail injection). Fuel injection systems were supplied by Delphi on the lower power level versions (up to 66 kW/90 hp) and by Continental (ex Siemens) on the higher power level versions (70 kW/95 hp and higher). Delphi systems were changed with Bosch ones in Euro 5 version. 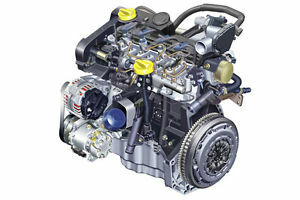 There are three versions of this engine: a low power version, a high power version and a high power version with variable geometry turbocharger. Their maximum power output varies depending on the emission standards they meet. In Euro 3 standards, their power levels are 65 PS (48 kW), 80 PS (59 kW) and 100 PS (74 kW). In Euro 4 standards, their power levels are 70 PS (51 kW), 85 PS (63 kW) and 105 PS (77 kW). In Euro 5 standards, their power levels are 75 PS (55 kW), 90 PS (66 kW) and 110 PS (81 kW).